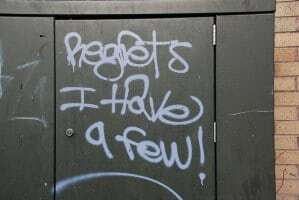 Let’s face it–we all have regrets. For instance, many years ago, I had the chance to buy an amazing triplex apartment in the heart of Greenwich Village for a steal. Didn’t do it. Had a shot once at telling off a total jerk who reeeaaalllly deserved it. Didn’t take it. Could have won a cupcake competition with the world’s best cupcake recipe. Didn’t enter it. Thing is, most times we can leave the past in the past. But, sometimes, those annoying little regrets bubble up to the present, taunting us for seemingly no reason at all. Then, it’s all we can do to try to push them out of our minds. And, turns out (not too surprisingly), these painful pangs of remorse tend to crop up most when we’re in our premenstrual Week 4. That’s the word from a 2014 study in the Journal of Clinical Psychology that found ruminating–churning negative, regretful thoughts over and over in your mind–is a common complaint during this phase of our cycle. Blame goes to plunging estrogen, which saps your brain of feel-good chemicals, making you prone to dwelling on mistakes. Like, for not going back to school when you had the chance. Or cutting off a friendship you realize you shouldn’t haven’t ended. Or for not buying a killer triplex apartment that would have made you a multi-millionaire so you could retire by the age of 34. 1. Look for a silver lining, for instance, maybe you learned a good lesson that stayed with you and prevented you from making a bigger mistake. 2. Make a joke out of the situation. 3. Simply accept the situation for what it is. In a 2011 study in the journal Anxiety, Stress, and Coping, participants dealing with thoughts of failure who tried any of these three methods were significantly happier than those who tried other ways of dealing with pain from the past, such as venting to friends or trying to ignore the issue and hoping it goes away on its own. As the researchers explain, unlike other coping mechanisms, these three reverse negativity by turning your thoughts in a more positive direction.